At Escape Arena you play the coolest escape rooms. 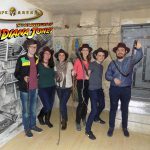 Come and play the coolest Escape Room in Bucharest! 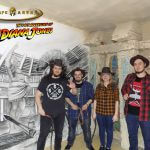 Experience a great adventure, Book now the Escape Room “The Last Adventure of Indiana Jones”! It will be hard, you’ll have to face many challenges and pass difficult traps from the ancient temple. Indiana Jones went in search for one of the most desired artifacts, The Holy Grail, but he disappeared for some time without anyone knowing whether he is alive or dead. You, his student, worrying for him, decided to start a journey for finding him. Finally, after a long-lasting search and many days spent, deciphering the notes in his office and following a map from his journal, you arrived at the ancient temple from Escape Arena where it looks like Indiana Jones has been seen entering the last time. Grab your friends, become Indiana Jones’s students and start the journey for finding The Holy Grail. We are waiting for you at the best escape room from Bucharest. The sand in the hourglass flows faster when you are immersed in the game. The basic rules remain the same! You have no success solving the puzzle? Don’t panic! The arena guardian can give you maximum three clues at your request. Use them wisely in case you feel stuck. We are not just another escape room. The fascinating adventure you will have will take you through a world of mystery sprinkled with adrenaline, extreme situations and unforgivable memories. You will lead a battle for discovering clues. The captivating scenery will distract your attention but a true gladiator can overcome any challenge. …one for all! You won’t enter the arena by yourself but together with 1-4 friends. Team diversity is limited by the minimum age of 12 yo and children under 15 yo can only enter the room accompanied. Teamwork and individual skills will help you overcome every challenge in your journey full of mysteries. Time goes quickly once you enter the room, you will have only 75 minutes to get out. Can you manage to overcome all obstacles? Very interesting room, with exciting puzzles and a breathtaking decoration. Another important aspect is that you have 75 minutes to escape. I strongly recommend. This game is an absolute must. It's not the best puzzles you have ever seen and there are definitely some areas for improvement but the scale and finish is like nothing else I've ever done. We've done a lot of games. Great for experienced teams. 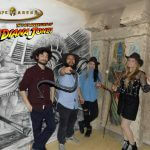 The "Indiana Jones" escape room of Escape Arena is highly entertaining and brilliant in its puzzles and quests. My friends and I had a great experience and would recommend it to anyone. 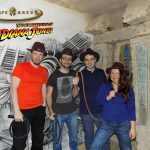 Indiana Jones is by far the best escape room in Bucharest. The decor was amazing and the puzzles were really well thought. It's definitely a must for any escape room enthusiast, as well as for any first timers. This place is incredible. The crew explains everything you need to know, but the rest is up to you. The room was unbelievable. Pretty awesome done and I cannot wait to come back and try other rooms. Big thumbs up!!! The most exciting room in town! So captive and interesting, the DECOR is amaaaaazing! And it s the most authentic and expensive room (invested&created) from Bucharest. We loved it! Indiana Jones - one of the best games I've ever played before. Great technic and everything worked properly, very exciting riddles, every team-mate had something to do and our game-manager was really professional and nice! We're looking forward to playing another game on our next visit to Bucharest! Thanks from the whole Wisdom-Team! You will feel like Indiana Jones himself! I definetly recommend the place. Go there even if you pay a little higher price (compared to others). For the Indiana Jones game you have 75 instead of usually 60 minutes and the game is completely working without locks! Decoration is detailled and very realistic. The riddles are fantastic. 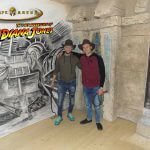 You will feel like Indiana Jones himself! Nice staff too - excited to play the upcoming rooms! All the best from Berlin to you guys. 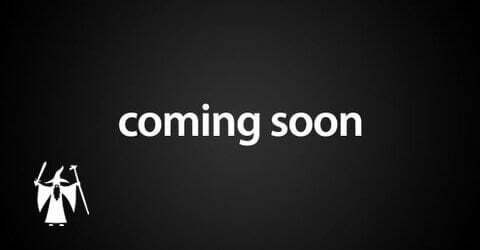 *The payment can me made cash or by credit/debit card. Is your team able to do it?